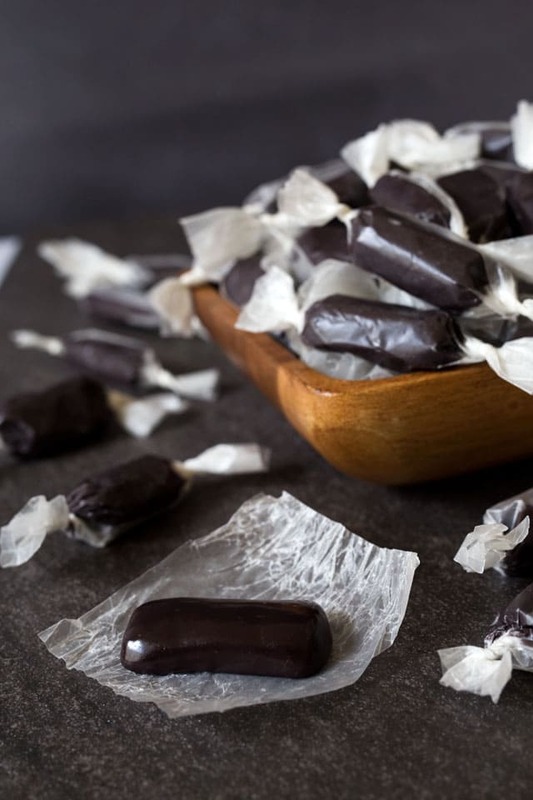 These Black Licorice Caramels are a cross between black licorice and soft buttery caramels. 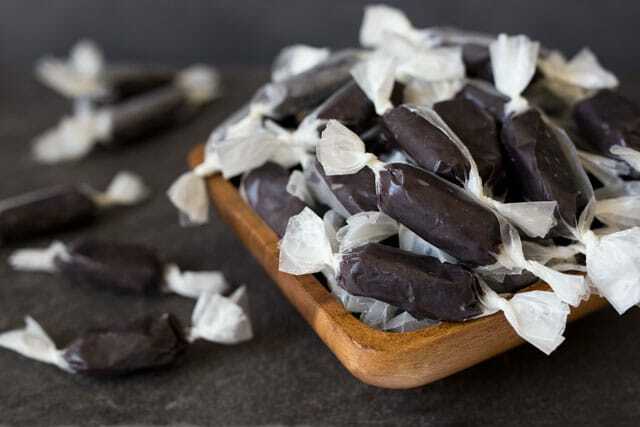 They’re easy to make, and are a perfect gift for the black licorice lover in your life. My dear, sweet, friend and neighbor, Betty, brought me a batch of theses black licorice caramels recently when I had family in town for my nephew’s funeral. She’s one of the most thoughtful people I know, and always has a smile on her face. She’s a remarkable woman. She has the energy of someone half her age and always has a project she’s working on. Recently, she leveled the ground in her yard for a shed she was having delivered. We share a love of baking, cooking and of course eating sweet treats. 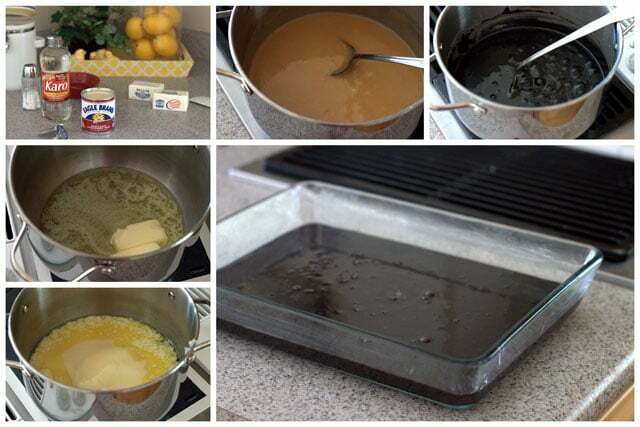 My family loved the black licorice caramels she made us so much that I asked her if I could come over to her house and have her teach me how to make them. I’ve always been a little bit afraid of making candy at home because I tend to burn myself on the hot syrup. But this recipe really isn’t scary and neither of us burned ourselves. The caramels are easy to make. Betty’s been making them for over 20 years. She’s tweaked the recipe over the years and prefers to add a lot more anise oil than the original recipe. She uses 1 1/2 tablespoons of anise oil, which I thought was just the right amount too. 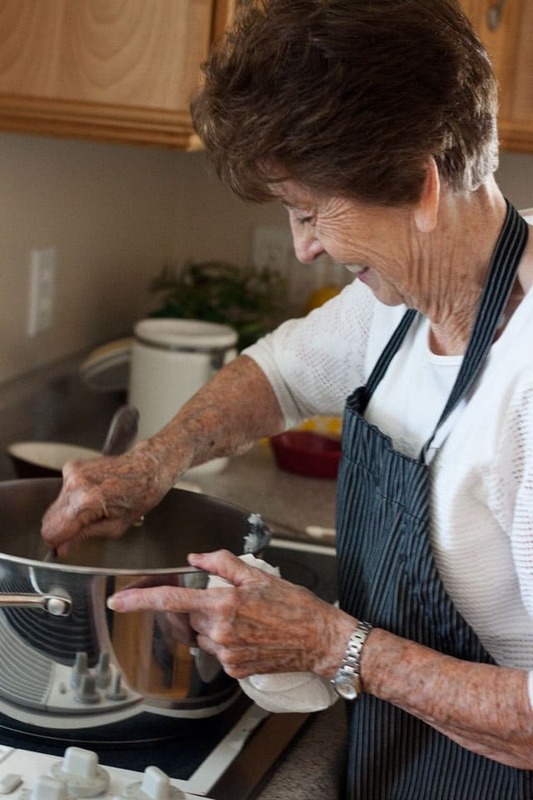 She prefers not to use a thermometer when she cooks the caramels, and use the cold water candy test to cook the syrup until it’s at a firm soft ball stage – a firm-ball 242°F (sea-level). That would make it about 232° at my altitude in Salt Lake about 4,000 feet, or 238° for a firm caramel. Betty also likes letting the caramels set up overnight before cutting them. Betty cuts the caramels in to about 1 inch squares. She then shapes them in to a rectangle as she rolls them up in waxed paper. She came over to my house the day after we made the caramels and showed me how to roll them. It goes pretty fast when you get the hang of it, especially when there are two of you rolling. You can cut the caramels in the pan, but it’s easier to take them out of the pan to cut them. I used a long watermelon knife to cut them in to rows. My rows weren’t very straight, but I just cut the pieces longer on the skinny rows. The caramels were easy to shape in to a rectangle as you’re wrapping them. I thought about sharing some of this second batch of black licorice caramels with my neighbors, but my family gobbled them up so quickly there weren’t any left to share. Guess I’ll have to make more soon. Butter a 9x13” glass dish with buttered foil. In a large heavy bottomed pan, melt butter over medium heat. Stir in sugar, milk, corn syrup and salt. Bring to a boil, stirring frequently. Continue cooking over medium-low heat, until a small amount of syrup dropped into cold water forms a *firm soft pliable ball, about 238°. Remove from heat. Add food coloring and anise oil, and mix until the oil is completely incorporated. Pour into a buttered 9x13” glass pan. Let caramels cool over night. Remove caramel from the pan, cut into 1 inch pieces. Wrap in 5x4 inch pieces of wax paper and twist the ends to enclose the caramel. * a firm-ball 242°F (sea-level). That would make it about 232° at my altitude in Salt Lake about 4,000 feet, or 238° for a firm caramel. These are incredible! Your instructions worked perfect. I wonder how long these stay good for. I just made them on 11/18/18. Do I store them in an air tight container after I wrap them? Are they good for 1 week or 4weeks? I’m planning for the holidays and trying to make things in advance. Thank you. What anise oil do you use? Brand, type? I’m struggling to find it. I always prefer to use exact ingredients when I try a recipe for the first time. What is the brand of the black paste? Is it the same as gel food color? Thanks! Can Anise extract be used or does it have to be Anise oil ? Hi Jessica – I haven’t tried it with extract, but you could try substituting it. You’ll need more extract though because extract has a amount of oil mixed with other ingredients to create a flavoring. Hi there I’m trying a few recipes for anise caramels, my first attempt started out really good but within a day they started to crystallize.. everything I’ve read says this may be from stirring to much? Your recipe says to stir frequently. Have you had this issue? No shelf stability? Hi Shelley – I haven’t had any problem with crystallization. Candy is not my expertise, though I have a good friend who also makes this recipe. You could try messaging her https://www.facebook.com/Chocolot-56258222370/ and seeing how to deal with the problem. How sweet of your neighbor to bring something over to show her care and concern for your family in their time of need. I’m glad you were able to have a happy time later on making these caramels and sharing her recipe with the world. I made a similar recipe, last Christmas. Friends, who swore they hated black licorice, couldn’t stop eating them. They are so good! This is a wonderful recipe. My hubby would love these. So sorry about your nephew. Black licorice caramels are some of my favorite candies. My dad goes crazy when I send him a homemade batch. Sweet story, Barbara. 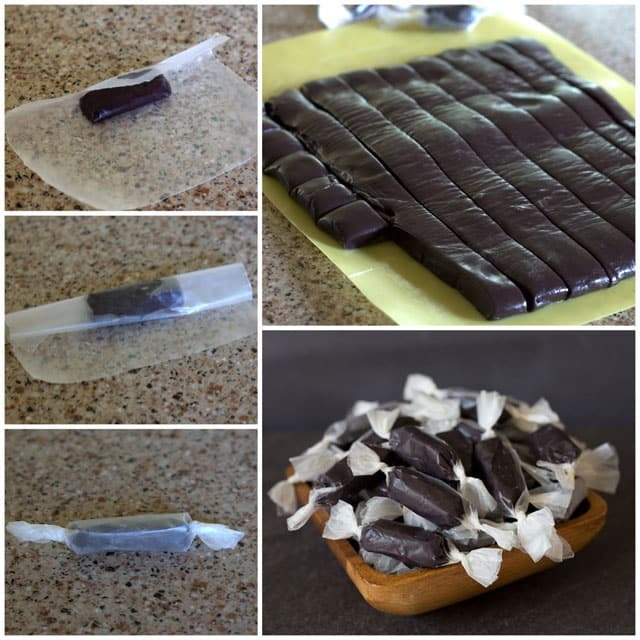 I’ve grown to like licorice more as I get older, these would be so fun to make instead of ordinary caramels (though I like them too:). Great seeing you today. I’d love a baking date… maybe bagels or something interesting like that?! Two of my most favorite people! Looks so good! Fun memories! Thanks Helen the feeling is mutual. No way! I had no idea that you can mace licorice candies at home! Perfect, my mom turns 92 on the 25th and she loves licorice. My condolences to your family. The candy looks so good, one of my favor flavors too!